Are you ready to do investing on your own? You see, it’s really simple to make money by investing in Philippine stock market, but it can be not easy for many. The last thing that you want to happen to your hard-earned investment is to see it going down, like the one experienced by a reader below. Worse is that he seems to have no idea what to do. That happens because from the start, many fail to see the bigger picture and don’t draft an investing plan that will suit their needs and goals. So how do you avoid having that same mistake happening to you? Simple: Know by numbers what kind of company your money is going into. By knowing the numbers, you will be able to create a good target or goal on where to get in and out of the market. There are currently several Philippine stock market resources available you can subscribe to and choosing one seems to be a daunting task. How do you know which one is serious in helping you make big money in the market? One I recommend is Truly Rich Club. Related review is available here. Now in this post, I made a performance review of yet another useful resource you can take advantage of – Pinoy Investor Newsletter and showed how it exactly works for anyone investing or trading in Philippine stock market. Pinoy Investor Newsletter started around July 2013 initially giving twice-a-week PDF newsletter that aspired to deliver timely research, reports, and analyses from its 7 partner brokers to its premium members. After around one year operation, they have now transformed their service into something bigger and better that gives information access to its members every SINGLE trading day. Pinoy Investor has one mission for its members – and that is for them to make smart (stock market) investment decisions. It attempts to help its members do this by giving practical Philippine stock market-related information including Top Stock Picks, Target Prices, Buy/Sell/Hold recommendations, and Technical Analyses from EIGHT brokerage firms in the Philippines – First Metro Securities, RCBC Securities, AngpingOnline, ABCapital Securities, 2TradeAsia. Unicapital Securities, Regina Capital Development Corporation and DA Securities. With this set up, you can imagine subscribing to Pinoy Investor as your way of getting one-point-access to researches of all these stocbrokerage firms. All these information are easily accessible and consolidated in one single site which is now a log-in away – Pinoy Investor member’s page. With PinoyInvestor, you can become an intelligent and independent investor – and not just someone who randomly follows stock advice – as you get A LOT of stock market information/analyses every week and FREE access to loads of educational stock market resources in the PinoyInvestor Academy! You can try out PinoyInvestor for FREE first and check how it can help you – Pinoy Investor TRIAL sign-up page. 1. Stocks Reports every day of the week. To make better decisions in a fast-paced market, you need faster access to information. With the new PinoyInvestor, you’ll get quicker access to reports — not just on Sundays and Wednesdays — but every day of the trading week. No more twice-a-week PDF newsletters. PinoyInvestor website just gets updated every day so you’ll always get stock reports when you need them! All sections, including Stock Rankings (PSEi, Growth/Vajulue, Speculative) and Technical Analyses will be updated too every day. 2. All reports for 1 stock in 1 page. 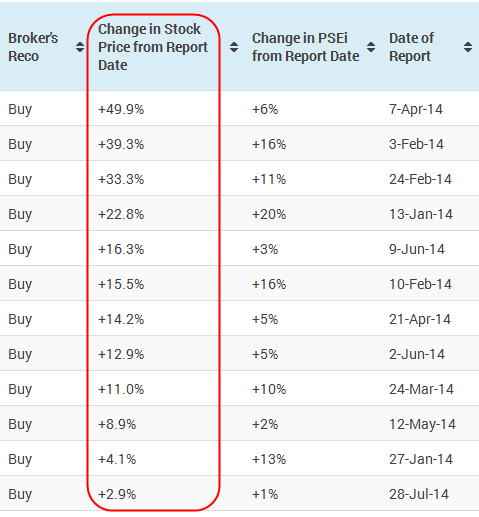 People are most likely interested only in a few stocks, not in all PSE-traded stocks. So to help you filter through the clutter, all information for 1 stock are consolidated under 1 page. Everything you need to know about a company (Stocks in Focus, Technicals Talk, Corporate News, Cash Dividends Update, etc.) will be accessible in this single page. 3. Easily search past reports. You want to find out oits ur partner brokers’ IPO analysis of Double Dragon (DD) made in March 2014. You want to compare the Target Price of Puregold Price Club (PGOLD) back in November 2013 and also on February 2014. You can search these and easily browse for all reports for any stock in its coverage and other past reports easily using only one click of the “Search” button! Simply click on the “All Stocks” menu bar OR just search for the stock in the Search bar. 4. Sort the Stock Picks the way you want it. Before Stock Picks list was fixed and not dynamic. In the new PinoyInvestor, you’ll be able to sort the Stock Picks alphabetically, by category, or by profit potential — basically just like how you want it! This will enable you for example to filter which stock has the biggest PROFIT POTENTIAL, most BUY recommendations or most SELL recommendations. 5. Get NEW tools for Technical Analysis. This NEW feature of PinoyInvestor, called the TECHNICALS LISTS, will be helpful to short-term traders and Technical Analysts. Aside from guidance on support and resistance levels, the Technical List will contain more detailed technical indicators (MACD crosses, stochastics, oscillators, etc.). With these figures, you can validate your analyses and entry/exit points for a more profitable trade. 6. Browse, don’t download. Finally, the shift to the new version of PinoyInvestor will retire the use of PDF files to be downloaded. You’ll get access to all the above information you want by simply browsing through the new PinoyInvestor website! What kind of market players does PinoyInvestor target? With the design of PinoyInvestor, one can see that this newsletter has ALL the tools and reports to cater to BOTH long-term investors and short-term traders! 1. STOCK RANKINGS: Get access to ranked PSEi stocks, Growth/Value stocks, and Speculative stocks! You can even rank these according to the most number of partner brokers’ Buy recommendations, Potential Profit % upside, or whatever you want. The All Stocks Ranking present in a table all its covered stocks for you to rank by whatever criterion you want (most number of our partner brokers’ Buy recommendations, Sell recommendations, Potential Profit % upside, etc.). The information (Target Prices, Buy / Sell / Hold recommendations, etc.) in its Stock Rankings section uses Fundamental Analysis and are thus useful for long-term investors. 2. STOCK IN FOCUS: These are Fundamental Analysis reports for several stocks that its partner brokers cover! Here you’ll see the different perspectives and analyses about company performance, recommendation ratings (Buy? Sell? Hold? ), and Target Prices. 3. CORPORATE/LOCAL NEWS: This section shows the latest and most important news about companies and the macroeconomy as a whole. With this you’ll know what covered companies are investing on, expansion plans, business performance, and even Philippine news about GDP, inflation, bond yields, and related news. 1. TECHNICALS TALK: This will give you access to its partner brokers’ Technical Analysis for various stocks! This is perfect for short-term traders as you’ll get to see various stocks’ support and resistance levels, chart patterns, and trends so you can confirm your own technical analyses and take advantage of potentially profitable, short-term trends. 2. TECHNICALS LISTS: For even more in-depth short-term trading information, you can see several, timely technical indicators for even more stocks in this section. If you’re looking for details on RSI, MACD, ADX, technical events, chart formations, and recommendations, the Technical Lists definitely have you covered. 3. MARKET OUTLOOK: This section allows you to see information and analyses about the Philippine Stock Exchange Index’s (PSEi) short-term movement, every day from several of its partner brokers! Access to CREDIBLE information/analyses: With PinoyInvestor, you can be sure that you’re getting expert and credible analyses and reports. Unlike unknown/no-name Facebook “gurus” or unproven personalities, PinoyInvestor’s source of information are registered and credible stock brokerage firms who have always been profiting in the stock market for a combined 100++ years! These are firms who make large transactions daily and have experienced all the highs and lows, ascents and crashes – and have still profitably earned from the Philippine stock market. Access to TIMELY information/analyses: With the New PinoyInvestor Stocks Portal, no longer do its members have to wait every Sunday and Wednesday for the latest stock updates and reports. This is because its portal get updated every day! Whether it be Stock in Focus Reports, Technicals Talk reports, or any other section in PinoyInvestor, members always get new and timely analyses every day to help them make even smarter and faster investment/trading decisions. Access to different points of view: As of now, PinoyInvestor has 7 (and soon-to-be increasing) partner brokerage firms. Thus, unlike other sources of information which have just one analysis/recommendation, expect to see different perspectives and analyses with PinoyInvestor. This should help ensure you that all bases of stock analyses (positive and negative alike) are covered and that one source’s “hyping” of stocks are prevented. Quick and easy viewing of research reports: As shared above, it is now easy to see ALL reports in PinoyInvestor and to look back at old ones! If you’re interested in only a few stocks, you can access each stock’s dedicated page in the New PinoyInvestor so you can see all reports associated with it! Help on BOTH long-term investing AND short-term trading: Finally, PinoyInvestor has the tools and resources to help short-term traders, long-term investors, and those with both short-term trading and long-term investing funds make smart stock market decisions. You won’t need a new resource in case you decide to shift strategy. As a final note, it’s note-worthy to mention that PinoyInvestor, while it caters to all types of investors and traders, clearly wants ALL its members to really become a smart PinoyInvestor: an intelligent and responsible trader and/or investor who has the ability to make independent investing decisions with the power of smart information on hand. PinoyInvestor is not the type of spoon-feeding resource that will just tell its members to buy this and sell that. Rather, it enables members to increase their stock market trading/investing competency, critical thinking, and maturity by consistently providing to them a wealth of information so they can truly make smart, informed, and independent investment decisions. So, if you’re the one looking for actual stock analyses, research, reports, and expert information being given on a regular basis, then YES, PinoyInvestor gives it to you, whether you’re in the market as an investor or trader. Long-term investors get these EVERY DAY: new Stock in Focus reports, Stock Rankings updates, Corporate News and Local News updates. There are also Special Reports, which are accessible to its website/portal as they are released. Short-term traders, on the other hand, get these EVERY DAY: Technicals Talk reports, Technicals Lists, and Market Outlook reports. A short summary guide when using PinoyInvestor is shown below. Here you’ll see that different sections in PinoyInvestor serve DIFFERENT purposes and are, thus, for DIFFERENT strategies and goals. This also means you can switch strategy anytime if you’d want to and Pinoy Investor stock market resource will remain helpful to you. These different sections available to you caters to different requirements, time horizons, and Investment Strategies as summarized below. So far, I see Pinoy Investor newsletter as one great stock market resource with the most extensive information, research and analyses that can indeed help anyone willing to learn become a Smart Pinoy Investor. This is a great resource if you’re serious to enhance your trading and investing skills and make BIG money in the Philippine stock market. However, if we’re talking about actual stock analyses, research, reports, and expert information being given on a regular basis, then YES, we upload them every day for both investors and traders! Long-term investors get these EVERY DAY: new Stock in Focus reports, Stock Rankings updates, Corporate News and Local News updates. Special Reports, on the other hand, are uploaded to our website/portal as they are released. To try it out and start your way to become a smarter investor, you can just sign-up here (it’s free). Pinoy Investor has just released a new report last August 17 2014 on the performance of the recommended stocks of one of its partner brokers. Here are some interesting figures in the report. Ten (10) out of 13 stocks with BUY recommendation recorded more gains than the PSE index (PSEi). The same set of stocks generated an average return of 25.3%. One stock recommended a BUY had an almost 50% price increase, while the PSEi grew by only 6% in the same 4-month period. Nine (9) out of 13 stocks with BUY recommendation recorded double-digit returns, way above the PSEi’s performance. One stock with a SELL recommendation declined in stock price by 23.4% from the time the report was issued – a good call by our partner broker. Now, that’s just the result of having access to timely reports of full-time researchers of one brokerage firm doing full time job in screening stocks. Imagine having access to several other brokers – and there are seven of them, with ONE more adding to the team. That obviously gives you not just an easy gateway access to summarized reports but also a way of validating their recommendations and analyses. Another released performance report highlights how PinoyInvestor’s Stock Rankings beat PSEi, Mutual Funds, UITFs in 1H 2014, shown below. You can click here to find out how this analysis was made. Aside from that, Pinoy Investor doesn’t only give reports; it also has a lot of resources and informative pages in case you’re just starting in the Philippine Stock Market. If you’d like to enhance your general knowledge of investing and trading, you can take advantage of their free resources below.